Capt. 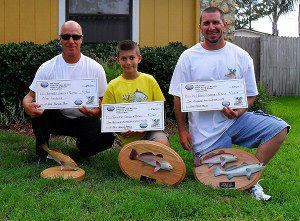 Nathaniel Lemmon travelled with his son in May to compete in the Florida Pro Redfish Series event held in Jacksonville. The duo threw soft plastics and Aqua Dream lures to catch a dozen tournament size redfish. Their two fish limit of 13.62 pounds took 1st place honors among the 26 boat field. Capt. Nathaniel Lemmon ventured to Northeast Florida to participate in the new Jacksonville Elite Redfish Series. These redfish tournaments are solo angler, lure only, and feature two fish bag limits. Capt. Lemmon caught small fish for the December tourney. January brought great fishing and a 2nd place finish with 13.23lbs. He wrapped up the series in February wining big fish honors with 7.85lb redfish and a 7th place finish. For the three events Nathaniel finished in 3rd place for angler of the year. For 2015, Capt. 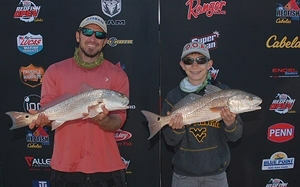 Nathaniel Lemmon has teamed up with his teenage son to battle the top redfish tournament anglers in Florida. The year started in Titusville with 71 other boats battling drastic weather changes that brought heavy winds. Perserverance paid off as they brought back 11.74lbs to the scale to claim a 4th place finish. They finished up the division in Fernandina Beach battling astronomical high tides. They claimed 24th place out of 80 boats with just shy of 10 pounds at the scale. After the 2 divisional events, they sit in 2nd place for Team of Year qualifying heading into the championship in Louisiana. Capt. Nathaniel Lemmon and his teammate Capt. 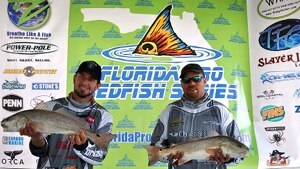 Patrick Rood completed the two events in the HT Redfish Series East Division and finished as the top overall team in the division. They began the year in Jacksonville, FL where they posted a weight of 23.54lbs which was good for a 3rd place finish. The team series next came to Titusville, FL and Capt. Lemmon and Rood led the tournament wire to wire to claim the 1st place finish posting a weight of 25.17lbs. As the overall points leader, the team is now qualified to fish the HT Redfish Series championship in Louisiana this October. Capt. 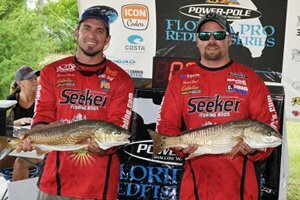 Nathaniel Lemmon and his teammate Capt Patrick Rood came out strong to start 2014 claiming 1st place in Titusville, FL on the IFA Redfish Tour. The defending FL East DivisionTeam of Year beat out 84 other boats with 14.75lbs for top honors. They also had biggest redfish of the tourney with an 8.39lb slob. In June, they continued their dominance claiming 5th place among the 77 boat field weighing 12.25lbs. With their two top 5 finishes they sit as the #1 team in the FL East division heading into the championship this October in Louisiana where they will look to repeat as divisional Team of Year. Capt. 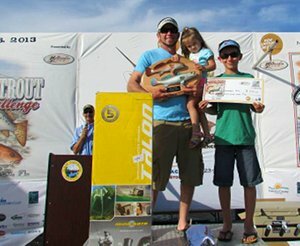 Nathaniel Lemmon again finished on the podium in the 2014 Fishstock Redfish and Trout tournament held in New Smyrna Beach. He had to find an alternate partner last minute because his son came down with the flu, so he teamed up with his pro series partner's wife. They grabbed a 3rd place overall finish with a combined weight of 34.00 lbs for the two day tournament. They placed 5th in the redfish division and 14th in the trout division among the field of 86 boats. His co-angler also finished 2nd in lady angler division.This makes the fifth time in six years he's finished in the top seven overall. Capt. Nathaniel Lemmon and his teammate Capt. Patrick Rood continued an impressive run of Florida east coast redfish tournaments, with their third win of 2014. 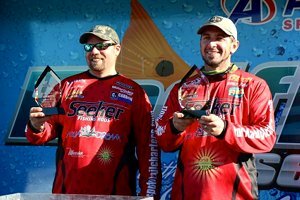 They weighed nearly 14lbs during the final event of the Florida Pro Redfish Series in Titusville. Capt. Nathaniel Lemmon and his teammate Capt Patrick Rood took 1st place for the Florida East Coast Division Team of Year in 2013. The team started off the IFA season in April taking a 5th place finish in Jacksonville with 12.44lbs out of a field of 75 boats. They next competed in Titusville, FL taking a 14th place finish with 9.44lbs among 76 boats. They wrapped up the year competing in the IFA Championship in Houma, Louisiana. They held 7th place after day 1, but finished in 22nd place after day 2 with a total weight of 30.60lbs among a field of 86 teams from around the country. The three tournaments put them in first place for the Florida East Division Team of Year standings. Capt. Nathaniel Lemmon and his teammate Capt. Patrick Rood (Deltona, FL) completed the innaugural year of the Florida Pro Redfish Series as the East Coast Division Team of Year Runner Up. In February they grabbed a 4th place finish in Jacksonville with 12.74lbs. In March it was a 6th place finish in Titusville with 11.59lbs. At the St. Augustine tournament in April, they eeked out a 8th place finish with 11.11lbs. They finished up the year with a 16th place finish in Titusville with 8.43lbs. Capt. 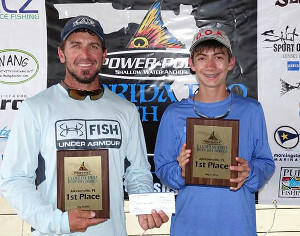 Nathaniel Lemmon again teamed up with his young son in the 2013 Fishstock Redfish and Trout tournament held in New Smyrna Beach.They grabbed a 3rd place overall finish with a combined weight of 31.06lbs for the two day tournament. They placed 4th in the trout division and 12th in the redfish division. "We caught nearly 50 redfish and a bunch of trout over the two days...nothing better than catching a ton of fish with your son and winning some money," Capt. Lemmon said. This makes the fourth time in five years they have finished in the top seven overall. Capt Nathaniel Lemmon teamed up with former ESPN Redfish Cup pro Capt. 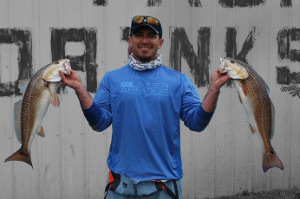 Paul Jueckstock (Port Orange, FL) to compete in the HT Redfish Series Icebreaker Open hosted out of Edgewater, FL in February 2012. The duo captured 1st place besting an 11 boat field with 12.2lbs. 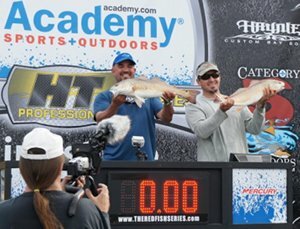 The tournament was a artificial lure only qualifier event to fish the HT Pro Redfish Series that travels around the Southeast US. "I laid out a good game plan on a few school of fish I found that had potential winning fish," said Capt. Lemmon. All teams were challenged mightly by the windy weather conditions and a winter fishing season dominated by 4-5lb redfish. "It's tough finding any 6lb+ redfish around here this winter," Lemmon said. "To find and catch two 6lb fish took a lot of homework." Capt. 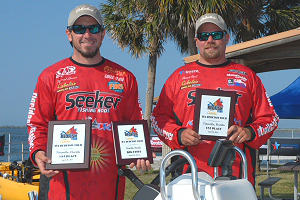 Nathaniel Lemmon and his teammate Mike Marple (Edgewater, FL) finished up the 2011 Xtreme Redfish Series in the Titusville division as the Divisional Team of the Year Runner-up. The duo competed in seven events held monthly from March through September. The tournament typically averages 15-20 boats each month and goes out of Riverbreeze Park in Oak Hill, which serves the Mosquito Lagoon area. Capt. Nate and Mike gathered five 2nd places, one 4th place, and one 11th place finish in the seven events. They weighed in over 12lbs for the two redfish bag limited in all but two events. Their top monthly weight was 13.08. Capt. Nathaniel Lemmon and his son, Corey, again teamed up with Capt. Tony Pantuso to compete in the annual two-day Fishstock tournament held in New Smyrna Beach. 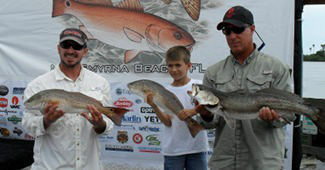 In 2011, the trio grabbed 7th place overall with a 30.12 redfish and speckled trout combined weight. Capt. 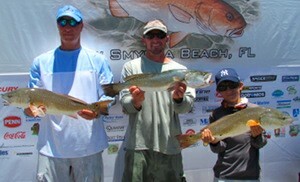 Lemmon's son took top honors though in the Junior Angler Division with a 1st place 6.52lb redfish they caught on day 2. This year the tournament shifted back to a big trout division which puts careful planning and strategy into play for the 90 plus boats to compete in the grand overall. "We spent a good portion of each of our day searching for a big trout bite, skipping over better redfish," Capt. Lemmon said. "You can make up a lot of ground with big trout, but we only caught 4lb'rs each day." This marks 3 years in a row Capt. Lemmon has placed within the top 7 overall at the Fishstock tournament. Previous finishes included a 2nd and 4th place. Capt. Nathaniel Lemmon teamed up with Capt. Mark Powell (Jacksonville) to compete in the final Xtreme Redfish Series event for the Titusville division in September. 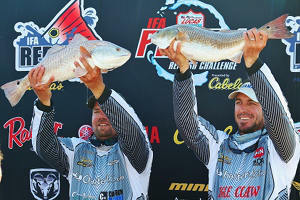 They grabbed 1st place in the tournament, besting a field of 14 boats with a 13.86lb bag weight for their two redfish. "We fished the far north end of the Mosquito Lagoon, on some great fish I found," Capt. Lemmon said. "I think we caught 20 or so fish, most of which were right at the bump line." Capt. Lemmon fished three events in the Xtreme series in 2010. 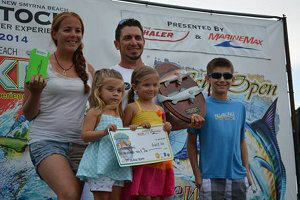 In the August tournament, teamed with Mike Marple (Edgewater, FL), they grabbed a 3rd place event finish. Capt. Nathaniel Lemmon and his son, Corey, teamed up with Capt. Tony Pantuso for the two-day Fishstock tournament held annually out of New Smyrna Beach. The trio grabbed 1st place in the Redfish Division and 1st place in the Redfish jackpot with a 25.88lb total weight; they also captured 2nd place in the overall top boat honors. "I found and then scouted our particular fish for weeks leading up to the tournament, I knew them so well by the tourney," Capt Lemmon said, "my little boy was a star, he caught several 6lb redfish and our 2.3lb trout." A new tournament rule requiring trout to fit in the 15-20" slot range changed strategies for all 90 teams battling for the inshore titles. Teams this year were prohibited from keeping the big gator trout Fishstock is famous for. "It really made this a redfish tournament, with a trout kicker," Capt. Lemmon said, "we caught a lot of trout, but big redfish weights were a must to compete." The trio won over $5,000 in cash and prizes for their efforts. Capt. Nathaniel Lemmon and his teammate Capt. Tony Pantuso captured 4th place overall finish in the annual Redfish and Trout Challenge at Fishstock 2009 held in New Smyrna Beach, FL. The tournament saw 88 boats vie for over $15,000 in cash and prizes. Capt. Nate and Capt. Tony weighed in 34.28 pounds in redfish and trout over the two day event, missing third place by .29 pounds. Teams were allowed to weigh 2 redfish and one trout per day. "We were so close to winning that tourney, we caught two redfish each day that were an 1/8" over the 27" allowed size, but instead had to settle on fish that were 2 pounds lighter," Lemmon said." Tony caught the two speckled trout we weighed, a 7.26lb gator on the final day and a 6.34lb trout on day one." The teammates caught over 30 fish during the weekend, an impressive total coming off a week of torrential rains that dumped over 20 inches upon the area.